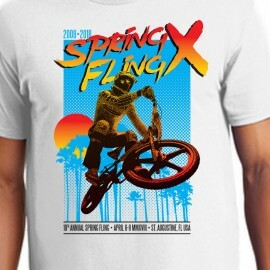 Florida BMX Spring Fling 2018 shirt. Celebrating 10 years of BMX and the friendships we've made! Features the official 2018 Spring Fling logo, and Andy Patterson design by Jay Marley, and all sponsor names. Print on front and back of shirt. Available in the colors and sizes shown in the dropbox above with full color graphics. 100% of the proceeds of this shirt go towards the Spring Fling Fund.